This is a review of the Glade Wax Melt scents from Spring 2019. 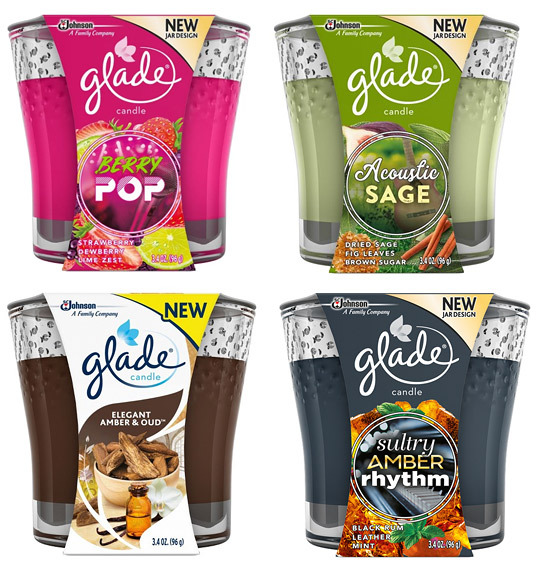 These new Glade scents are only available in candle form. I haven't found them in wax melts, so I scooped out the candle wax to use in the warmer instead of burning the candles (which is easy to do, since the wax is very soft, like tub margarine). Since Glade candles use a very soft wax and Glade wax melts use a very hard wax, the throw ratings may be different for the melts. If I can find the wax melts, I will update my review. Smells a like like Glade Volcanic Coconut Cove that came out April 2018, a nice smoky milky coconut. But it's not the same scent. This scent seems to use the Volcanic Coconut Cove scent as a base, but adds a hint of sweetness, a smidgen of cinnamon, a tiny bit of a foodie note like caramel or rum, a little bit of a cologney note, and a tiny bit of wood. Oud is a deep resinous almost tree sappy woodsy scent, and I don't smell that type of wood scent per se. Amber adds a warm note to scents, and I think I do smell that a little bit. Looking at the notes, I don't smell jasmine at all (but maybe that's the slight sweetness). It's not a floral scent at all. It also smells a bit like ScentSationals Fire Amber and Goose Creek Cozy Home. Great scent!